MK Dons player ratings from the 2-1 win over Southend on Monday. Lee Nicholls - 6 - Not a lot for the keeper to do, other than pick out a stoppage time penalty from hit net. Dean Lewington - 7 - A typically solid performance from the skipper. Joe Walsh - 8 - Kept close tabs on Simon Cox for the most part, while opening his League 1 account. Could have had a brace come the end of play too. George Williams - 8 - Marking Nile Ranger was a tough ask, but Williams was more than a match for him all afternoon before the Southend striker was withdrawn. Callum Brittain - 8 - After being played out of position on Good Friday, made a much better account of himself at right back. Slotted in very well. Ed Upson - 5 - Unusually off colour, struggled with his touch and control. Had a great chance to open the scoring in the first half but headed wide. Darren Potter - 7 - His usually assured self. Stuart O'Keefe - 7 - Buzzed around the midfield causing a nuisance. Played a big part in Dons' second too. Harvey Barnes - 8 - Started quietly, but grew into the game, and by the end was Dons' best player on the pitch. Ben Reeves - 8 - After some indifferent performances of player, Reeves stood out at Roots Hall. Good set pieces, a well-taken goal and a constant threat. 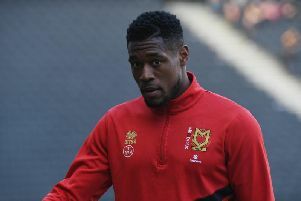 Kieran Agard - 7 - Alert to dangers, was always a yard ahead of defender Anton Ferdinand. Unlucky not to have a goal to his name. Robbie Muirhead - 6 - Didn't really change much when he came on for Agard. George Baldock - 4 - Gave away a needless penalty in stoppage time. Ben Tilney - A stoppage time substitution.